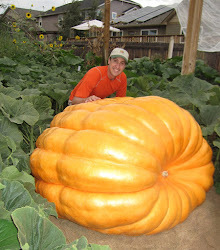 The following is a modification of my "secret" giant pumpkin fertilizing program. The soil requirements for this new pumpkin patch is much different than my old patch, so I've made some changes. In addition to what is listed below, I'll also be putting down a little Azos, myko, kelp and Humic acid to each leaf node. What is listed below doesn't include what I amended the soil with in the Fall and Spring. Most of the fertilizers and nutrients products are NPK Industries' RAW fertilizers. Week 1 B-vitamin, liquid seaweed/kelp, compost tea. With RAW Microbes and Azos in the planting hole.